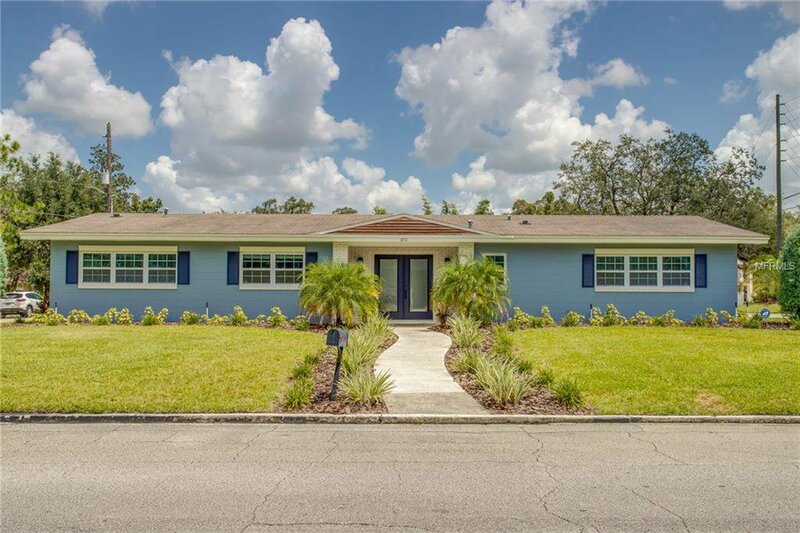 Right across the street from Lake Baldwin Park and NO HOA!! All the work has been done and this amazingly updated 5 bed/3 bath home sits on 1/4 acre and is completely move in ready and waiting for you. Plus it’s just seconds to the Baldwin Park Village district. Upon entry from the expertly landscaped front yard, you are met with neutral tones, gorgeous and maintenance free terrazzo flooring throughout the living areas, and contemporary fixtures with artisanal flair. A huge great room greets to you first and offers an open canvas for functional use. Plus you will notice the abundance of sliding glass doors and windows which allow so much natural light. Step into the gourmet kitchen which offers plenty of unique marble counters, modern custom cabinets, breakfast bar island, glass tile backsplash, pantry, and newer stainless appliances. The HUGE master suite has a walk-in closet with custom organizers and a separate shoe closet, plus a wood-look accent wall. The attached ensuite has been totally updated with dual above counter glass sink vanities, and a glassed step-in shower. A junior master suite has access to the 2nd updated bath, which is where you will find a convenient utility closet for comfortable laundering. The back yard is HUGE and features an open patio so bring the outdoor furniture! The Baldwin Park area is such a unique community where lakefront running trails, parks and eclectic boutique shopping are just a few of the offerings this sought after area provides. Listing courtesy of KELLER WILLIAMS WINTER PARK. Selling Office: KELLER WILLIAMS AT THE PARKS.